The United States Carriage Company specialized in building cabs, hearses and ambulances and was amongst the first firms to market an auto hearse. They were also the manufacturer of the Great Eagle automobile. U.S. Carriage was formed by Charles Frederick Myers, a 13-year-old German immigrant who arrived in Columbus Ohio in 1869. He apprenticed at one of the Carriage City’s numerous vehicle manufacturers and went on to found the United State Carriage Company sometime in the late 1870s. Located in downtown Columbus at the corner of South 4th and Main Sts., Myers initially built Broughams and Landaus in the continental style, but during the late 1880s he began to specialize in service vehicles, specifically hacks, hearses and ambulances. During that period J. T. Davies, who would later achieve fame as Crane & Breed’s chief body designer, was a journeyman at the firm. 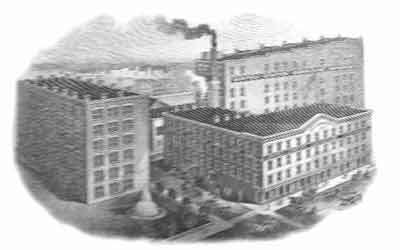 By the mid-1890s additional manufacturing capacity was badly needed so Myers took on a partner named Col. Atcheson, incorporating the firm in May of 1896 with a re-capitalization of $300,000. On November 3rd of that year a fire destroyed the main structure of their 309-319 S. 4th St. factory causing a reported $30,000 in damage, all of it covered by insurance. By the turn of the century, hundreds of the firm’s vehicles had been sold to funeral homes and liveries across the Midwest. However, Myers and Atcheson didn’t get along and on March 25, 1899, a circuit court judge settled a suit between them by ordering the sale of the firm. Myer’s, the majority shareholder, kept control of the firm and his son Frederick joined him in the management of the firm soon afterwards. Myer’s two sons had spent their summers at the factory, but only Frederick Christopher, born August 5, 1883, followed in his father’s footsteps. His other son, John Wesley, elected to go on to University where he studied medicine, becoming one of Columbus’s most prominent physicians. Frederick C. Myers proved an able administrator, and shortly after the turn of the century, his parents went on an extended tour of Europe, returning to the place of his birth. Unfortunately, Charles Frederick Myers passed away during the trip and was unable to take his last ride in one of own creations as he was interred in his homeland. Frederick Christopher Myers assumed the presidency of U.S. Carriage which continued to manufacture livery and professional vehicles. Their first motor hearse body was built on a 1907 Packard chassis, and by late 1909 they announced to the trade that they were going to produce their own vehicle. Between the late 1800s and the early teens, United States Carriage Co. participated in the annual Ohio Agricultural and Industrial Exposition which was held each fall in Columbus. The firm’s early exhibits at the Expo’s Vehicle Hall included landaus, broughams, hearses, hacks and ambulances. Their 1909 exhibit consisted of motorized limousines and conveyances for the dead and injured on various chassis. In 1910, the firm’s first automobile was exhibited alongside their professional car offerings. Many of U.S. Carriage’s existing customers were in the funeral and/or livery business, and the firm’s sturdily-constructed chassis was designed from the ground up for public service. 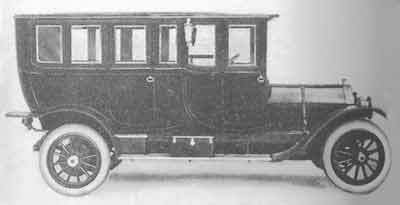 Christened the Great Eagle, the 40 hp prototype debuted the following February (1910) and was available with a 7-passenger limousine (Model 1215) or landaulet (Model 1217) body on a 126” wheelbase. The following year two new models were offered with a choice of limousine or landaulet bodywork. The Model 4-50 featured a new 36 hp four on a 135” wheelbase while the model 6-60 included a 41 hp six on a slightly longer 138” wheelbase. The Great Eagle was now marketed to two distinct groups, the Gasoline Car to the private citizen and the Public Service Car to municipalities and livery/funeral trades. A 72hp Rutenber six-cylinder was optional on the firm’s Public Service Cars. 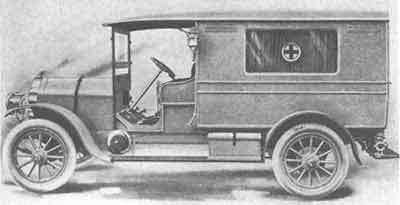 The 1911 Great Eagle Model 1241 Motor Ambulance rode on the firm’s 135” wheelbase 4-cylinder chassis and featured an open cab with an enclosed rear compartment, high-mounted rectangular plate glass windows, side ventilators and an electric gong. 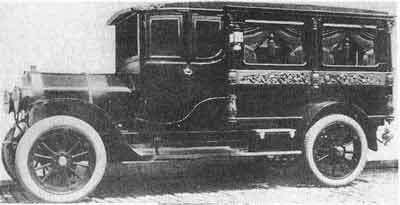 A differently-styled Motor Hearse on the model 6-60 chassis featured 6 conservatively-sized columns with four rectangular beveled-glass windows above the belt line which featured a wide band of intricately carved molding. 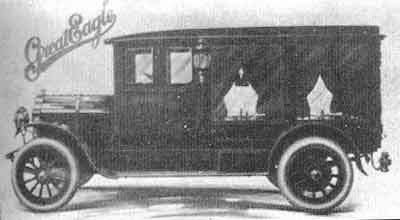 In 1912 Great Eagle offered a totally-enclosed 10-passenger undertaker’s limousine with a 72hp six-cylinder Rutenber engine on their all-new 141” wheelbase chassis. 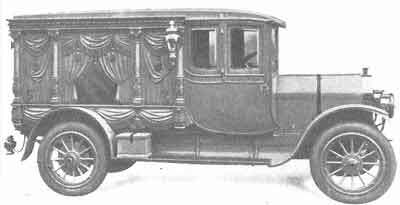 The model 1260 Motor Hearse rode on the shorter 135” chassis and featured an enclosed cab with 8-columns and intricately-carved faux draperies surrounding a centrally mounted plate glass window. Great Eagles of this era were easily identified by their leather-strapped engine-covers and massive proportions. In 1913 the Great Eagle chassis was revised once again. The 135” wheelbase Model B now included a 50 hp 4-cylinder engine and the 142” wheelbase Model C featured a 60 hp 6-cylinder engine sourced from Rutenber. The firm’s Public Service Cars were now available with a new 147” wheelbase chassis which was designed specifically for commercial applications. Typical of the firm’s professional cars were their 1913 offerings. 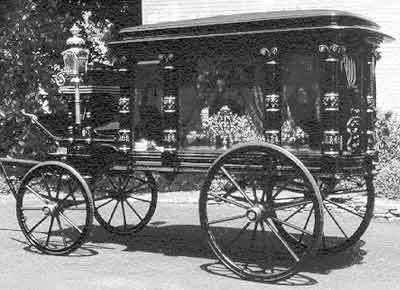 The Model 1252 6-column funeral coach was mounted on the 142” chassis and featured a casket compartment with four massive plate glass windows set upon intricate carved-wood panels. On the 147” chassis, Great Eagle offered the Model 1268 ambulance, a limousine-style rear-loading coach with a large frosted side window that included an attendant’s entrance just behind the driver’s side door. 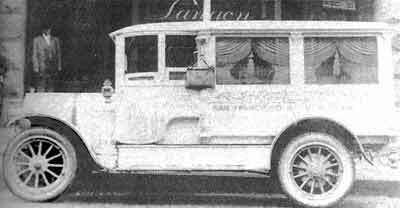 Also available was a totally different limousine-style invalid car that used 3 large sedan-style windows in the rear compartment. The service car line now included taxis, landaulets and limousines for livery service as well as police patrol wagons based on the firm’s limousine-style invalid cars. “The first automobile hearse in San Antonio has arrived and after a few days display at the Alamo Auto Sales Company’s show window, will be put in use by the Shelley-Loring Undertaking Company. “The hearse is long, low, gracefully-shaped, six cylinders, of “Great Eagle” make and was bought from the United State Carriage Company of Columbus, O., at an approximate cost of $6,000. It is of light grey color and has trimmings of silver and gold. The panels are hand carved, as are the doors and the entire front is shielded with plate glass. It has all the equipments of the modern automobile, a self-starter, electric lights, and a dome light, inside. It also has demountable rims and a removable mound on the inside, to be used in case of long trips. The interior is finished in mahogany. “Moran's Friends Have Brought His Body 3,200 Miles Toward Home. “Chicago, Oct. 2 – The body of Michael Moran of New York City, on its 5,000-mile automobile trip to the grave, passed through Hammond, Ind., to-day. “Peck laughed at him and said that if he did he (Peck) would see that he got an automobile, funeral all the way to New York. Within a few days Moran lay dying, and on bidding goodbye to friends, insisted that Peck keep his promise, giving his nurse a check for $5,000 to pay the expenses. Coincidentally, William A. Peck was the western sales manager for the United States Carriage Company, which had a sales office in Los Angeles. Peck made the most out of the free publicity and took numerous photographs of the Great Eagle hearse that was used to convey Mr. Moran. Unthinkable today, Peck even placed an advertisement on the side of the vehicle conveying the fact that it was traveling from “San Francisco to New York”. Peck, who was in charge of both US Carriage and Great Eagle sales in 27 states, later recalled that the free advertising he received on the trip was worth $15,000 to him. “Practically every newspaper along the route gave me a story and many of them were on the front page,” concluded Peck. The journey left from San Francisco’s Lanyon Funeral Home on August 25th and he arrived in New York on October 1st, after 37 days on the road. The fully enclosed Great Eagle funeral coach was equipped with a 72-hp Rutenber six-cylinder engine and heavy-duty Hoover springs that successfully carried the 6,560 pound vehicle and its cargo across the country. The only failure reported was a broken spring that occurred during the Nevada leg of the journey. For 1914 model designations returned to their original 1912 versions, albeit the horsepower was now reflected in the model number. The 50 hp, 4-cylinder became the Model 4-50, albeit with a new longer 138” chassis, and the 6-cylinder 60 hp was now called the 6-60. The Gasoline Car line included new a 2-passenger roadster (Model A) and 7-passenger touring (Model B & C), while the firm’s closed bodies were only available in the Public Service Car line. The Great Eagle line for 1915 was a repeat of the previous year’s offerings. Receivership for United States Carriage Company arrived in an interesting way. It was requested by Katherine Myers, wife of the president, who held a note of $6,000 against the company and feared her money would be lost if other creditors, who were threatening, were permitted to take action. The company went into receivership in February of 1915. A number of creditors were planning an action, but curiously, the firm’s receivership was requested by Katherine Myers, the wife of president Frederick Christopher Myers. She feared that her $6,000 personal investment in United States Carriage would be lost if the firm’s other creditors initiated the action. During 1918 rumors of a possible re-emergence of the Great Eagle were mentioned in the trades, however no evidence of a vehicle can be found. On March 2, 1917, all remaining assets of the United States Carriage Company were disposed of. Early on, the Great Eagle was occasionally referred to as the United, however no vehicles were manufactured under that name. There was another United State Carriage Company located in Andover, Maine that manufactured the French steamer at the turn of the century but the two firms were unrelated. Carl Burgess Glasscock – Motor History of America; Or, The Gasoline Age: The Story of the Men who Made it (pub 1945) First ed. published in 1937 under title: The gasoline age; the story of the men who made it.